Hello! We are the group of Worcester Polytechnic Institute students who worked with Ascentria Care Alliance, a social services organization based out of Worcester, Massachusetts. Our project was centered around aiding refugees in the transition into the Worcester community. 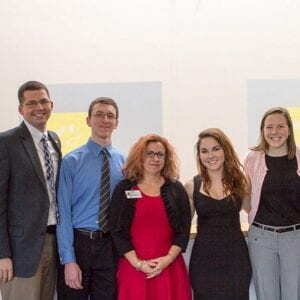 Our team was comprised of four juniors at WPI: Haley Dyer, a Civil Engineering major, Rebecca Seymour, Biology/Pre-Dental, Zachary Charland, Mechanical Engineering, and Brent Young, Chemical Engineering. Please check out Ascentria’s website! People have always been displaced by war, persecution, religion, famine and drought, but the response to these displaced people or refugees, has been sporadic. People were often left to the mercy of their homeland and whatever government was in place. Over time organizations, such as Ascentria Care Alliance, have developed programs to assist these new Americans but there are still improvements to be made. It is still extremely difficult for refugees to become integrated into a new community and this puts limitations on an individual’s success. Our project explored the metrics for successful integration into society. With these important factors identified, organizations like Ascentria will be able to better tailor their services to maximize the impact for their clients.